Keaton Grainger heads home. Photo: Stephen Willmer. Skegness United returned to action with a 4-2 victory over Market Rasen Town Development in the Town Trophy. Missing from United’s line up were Rhys Mansell, Jamie Turner and Conor Minor, due to work commitments, while Kieron Rayner-Mistry was injured. Ashley Reid, Arun Gray, Jonny Hodson and Zak Bray returned to the squad. The first 10 minutes was dominated by United, however Rasen began to come more into it with Tom Newitt being involved in most of their moves. However, once United took control again they were causing problems to the visitors’ defence. Although struggling to find that killer ball at times, Ben Togher pulled off some good saves to keep Rasen from going behind. During this period Alex Kendrick came close on two occasions, firing just wide from a good position and then seeing Togher saving a low effort. United finally went into the lead when an excellent cross from the right by Ryan O’Loughlin was met and headed home by Keaton Grainger. At half time United went in with a one-goal lead. However, on the balance of play they may feel it should have been more. Within two minutes of the re-start United went two up when Alex Forster robbed a defender and placed his shot into the far corner from an acute angle. United were still dominated the game with O’Loughlin, Graniger and John Courtney all going close before the hosts were shellshocked. On 62 minutes Rasen got themselves back into the game when, from a corner, Ian Williams was left alone at the far post and headed home. On 75 minutes the visitors drew level when a penalty was awarded for a push on a Rasen player by Jonny Hodson. From the resulting kick Williams, Rasen’s best player on the day, gave Jack Minor in the United goal no chance with his spot kick. The visitors were now in confident mood and United needed to regain the lead quickly. This they did within three minutes when neat footwork by Courtney, resulting in slicing the ball across the goal, saw Zak Bray was on hand to knock home from five yards out. On 80 minutes United sealed victory when a run by O’Loughlin into the Rasen box beat four players before he teed up Alex Kendrick, who fired the ball home. At the final whistle, United moved into the next round, however at times during the match they made it more difficult for themselves than it should have been. UNITED: J. Minor, Lyall, Read (Ashwell), K. Minor (Hodson), Simpson, Gray, Kendrick, Courtney, Grainger, O’Loughlin, Forster (Bray). 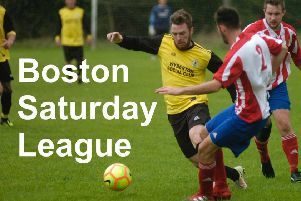 On Saturday United return to league actionwhen they entertain Alford United at Skegness Grammar School (KO 2pm).